For other people named Michael III, see Michael III (disambiguation). Michael III (Greek: Μιχαήλ Γʹ, Mikhaēl III; January 19, 840 – September 23/24, 867) was Byzantine Emperor from 842 to 867. Michael III was the third and traditionally last member of the Amorian (or Phrygian) dynasty. He was given the disparaging epithet the Drunkard (ὁ Μέθυσος) by the hostile historians of the succeeding Macedonian dynasty, but modern historical research has rehabilitated his reputation to some extent, demonstrating the vital role his reign played in the resurgence of Byzantine power in the 9th century. This coin struck during the regency of Theodora shows how Michael was less prominent than his mother, who is represented as ruler alone on the obverse, and even less than his sister Thecla, who is depicted together with the young Michael on the reverse of this coin. Michael was the youngest child of the emperor Theophilos and his empress Theodora. Already crowned co-ruler by his father in his infancy in 840, Michael had just turned two years old when his father died and Michael succeeded him as sole emperor on January 20, 842. During his minority, the empire was governed by a regency headed by his mother Theodora, her uncle Sergios, and the minister Theoktistos. The empress had iconodule sympathies and deposed Patriarch John VII of Constantinople, replacing him with the iconodule Patriarch Methodius I of Constantinople in 843. This put an end to the second spell of iconoclasm. As the emperor was growing up, the courtiers around him fought for influence. Increasingly fond of his uncle Bardas, Michael invested him with the title kaisar (Caesar – at the time a title second only to emperor) and allowed him to murder Theoktistos in November 855. With the support of Bardas and another uncle, a successful general named Petronas, Michael III overthrew the regency on March 15, 856 and relegated his mother and sisters to a monastery in 857. A conflict between the Byzantines and Bulgarian Empire occurred during 855 and 856. The Byzantine Empire wanted to regain its control over some areas of Thrace, including Philippopolis (Plovdiv) and the ports around the Gulf of Burgas on the Black Sea. Byzantine forces, led by the emperor and the caesar Bardas, were successful in reconquering a number of cities – Philippopolis, Develtus, Anchialus and Mesembria among them – as well as the region of Zagora. At the time of this campaign the Bulgarians were distracted by a war with the Franks under Louis the German and the Croatians. In 853 Boris had allied himself to Rastislav of Moravia against the Franks. The Bulgarians were heavily defeated by the Franks, following this the Moravians changed sides and the Bulgarians then faced threats from Moravia. Michael III took an active part in the wars against the Abbasids and their vassals on the eastern frontier from 856 to 863, and particularly in 857 when he sent an army of 50,000 men against Emir Umar al-Aqta of Melitene. In 859, he personally led a siege on Samosata, but in 860 had to abandon the expedition to repel an attack by the Rus' on Constantinople. In 863, Petronas defeated and killed the emir of Melitene at the battle of Lalakaon, and celebrated a triumph in the capital. Bardas justified his usurpation of the regency by introducing various internal reforms. Under the influence of both Bardas and Photios, Michael presided over the reconstruction of ruined cities and structures, the reopening of closed monasteries, and the reorganization of the imperial university at the Maganaura palace under Leo the Mathematician. Photios, originally a layman, had entered holy orders and was promoted to the position of patriarch on the dismissal of the troublesome Ignatios in 858. This created a schism within the Church and, although a Constantinopolitan synod in 861 confirmed Photios as patriarch, Ignatios appealed to Pope Nicholas I, who declared Photios illegitimate in 863. Michael presided over a synod in 867 in which Photios and the three other eastern patriarchs excommunicated Pope Nicholas and condemned the Latin filioque clause concerning the procession of the Holy Spirit. The conflict over the patriarchal throne and supreme authority within the church was exacerbated by the success of the active missionary efforts launched by Photios. Under the guidance of Patriarch Photios, Michael sponsored the mission of Saints Cyril and Methodios to the Khazar Khagan in an effort to stop the expansion of Judaism among the Khazars. Although this mission was a failure, their next mission in 863 secured the conversion of Great Moravia and devised the Glagolitic alphabet for writing in Slavonic thus allowing Slavic-speaking peoples to approach conversion to Orthodox Christianity through their own rather than an alien tongue. Fearing the potential conversion of Boris I of Bulgaria to Christianity under Frankish influence, Michael III and the Caesar Bardas invaded Bulgaria, imposing the conversion of Boris according to the Byzantine rite as part of the peace settlement in 864. Michael III stood as sponsor, by proxy, for Boris at his baptism. Boris took the additional name of Michael at the ceremony. The Byzantines also allowed the Bulgarians to reclaim the contested border region of Zagora. The conversion of the Bulgarians has been evaluated as one of the greatest cultural and political achievements of the Byzantine Empire. 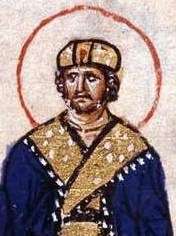 Michael III's marriage with Eudokia Dekapolitissa was childless, but the emperor did not want to risk a scandal by attempting to marry his mistress Eudokia Ingerina, daughter of the Varangian (Norse) imperial guard Inger. The solution he chose was to have Ingerina marry his favorite courtier and chamberlain Basil the Macedonian. While Michael carried on his relationship with Ingerina, Basil was kept satisfied with the emperor's sister Thekla, whom her brother retrieved from a monastery. Basil gained increasing influence over Michael, and in April 866 he convinced the emperor that the Caesar Bardas was conspiring against him and was duly allowed to murder Bardas. 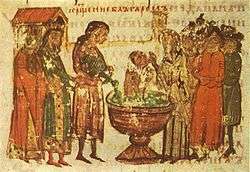 Now without serious rivals, Basil was crowned co-emperor on 26 May 866 and was adopted by the much younger Michael III. This curious development may have been intended to legitimize the eventual succession to the throne of Eudokia Ingerina's son Leo, who was widely believed to be Michael's son. Michael celebrated the birth of Leo with public chariot races, a sport he enthusiastically patronized and participated in. Leo VI presiding over the transfer of the remains of Michael III to the imperial mausoleum at the Church of the Holy Apostles. If ensuring Leo's legitimacy had been Michael's plan, it backfired. Ostensibly troubled by the favour Michael was beginning to show to another courtier, named Basiliskianos, whom he threatened to raise as another co-emperor, Basil had Michael assassinated as he lay insensible in his bedchamber following a drinking bout in September 867. Basil with a number of his male relatives, plus other accomplices, entered Michael's apartment; the locks had been tampered with and no guard had been placed. Michael's end was grisly; a man named John of Chaldia killed him, cutting off both the emperor's hands with a sword before finishing him off with a thrust to the heart. Basil, as the sole remaining emperor (Basiliskianos had been killed at the same time as Michael), automatically succeeded as the ruling basileus. Michael's remains were buried in the Philippikos Monastery at Chrysopolis on the Asian shore of the Bosphoros. When Leo VI became ruling emperor in 886, one of his first acts was to have Michael's body exhumed and reburied, with great ceremony, in the imperial mausoleum in the Church of the Holy Apostles in Constantinople. The reign and personality of Michael III are difficult to evaluate because of the hostile accounts written by Byzantine authors operating under Basil I and his successors. Byzantine accounts describe Michael's habitual drunkenness, his obsession with chariot racing and his orchestration of public displays mocking the processions and rituals of the church. The impression gained from Arab sources, however, is one of Michael as an active and often successful military commander. Though Michael III was allegedly prone to squander money, his reign stabilized the economy, and by the year 850 the empire's annual revenues had increased to 3,300,000 nomismata. The definitive end to iconoclasm early in his reign led, unsurprisingly, to a renaissance in visual arts. The Empire made considerable advances in internal organisation and religious cohesion, and it had more than held its own against the Abbasid Caliphate. Most importantly Bulgaria had been transformed into a religious and cultural satellite of Byzantium. Much of the credit for these achievements, however, must go to Theodora and Theoktistos up to 855, and Bardas and Petronas thereafter. ↑ "TITLE needed", Bulgarian Historical Review, v.33:no.1-4, p.9. ↑ On the 19th of December 858 Photios was a layman, on the 20th he was tonsured and over the next four days was ordained lector, sub-deacon, deacon and priest; on the 25th of December he was consecrated Patriarch of Constantinople. Photios was a kinsman of both Bardas and Michael III. See Tougher, p 69. Wikimedia Commons has media related to Michael III. Ahrweiler, H. and Laiou, A.E. (1998) Studies on the Internal Diaspora of the Byzantine Empire, Dumbarton Oaks. Finlay, G. (1856), History of the Byzantine Empire from DCCXVI to MLVII, 2nd Edition, Published by W. Blackwood. Fossier, R. (1986) The Cambridge illustrated history of the Middle Ages Cambridge University Press. Gregory, Timothy E. (2010). A History of Byzantium. Malden, Massachusetts and West Sussex, United Kingdom: Wiley-Blackwell. ISBN 1-4051-8471-X. Mango, Cyril, "Eudocia Ingerina, the Normans, and the Macedonian Dynasty," Zbornik Radova Vizantološkog Instituta, XIV-XV, 1973, 17–27. Tougher, S. (1997) The Reign of Leo VI (886–912): Politics and People. Brill, Leiden.